Australia's Great Barrier Reef is experiencing an unprecedented second straight year of mass coral bleaching, scientists said Friday, warning many species would struggle to fully recover. The 2,300-kilometre (1,400-mile) reef suffered its most severe bleaching on record last year due to warming sea temperatures during March and April. Bleaching is once again occurring, the government's Great Barrier Reef Marine Park Authority said after an aerial survey off Australia's eastern coast on Thursday. "Regrettably, the temperatures have been high on the Great Barrier Reef this summer as well and unfortunately (we) are here to confirm... a mass coral bleaching event for the second consecutive year," the Authority's reef recovery director David Wachenfeld said in a Facebook video. "And importantly, this is the first time we've ever seen the Great Barrier Reef bleached two years in sequence. We've seen heat stress build since December." Neal Cantin from the Australian Institute of Marine Science said. "We are seeing a decrease in the stress tolerance of these corals," Cantin added in a statement. "This is the first time the Great Barrier Reef has not had a few years between bleaching events to recover. "Many coral species appear to be more susceptible to bleaching after more than 12 months of sustained above-average ocean temperatures." 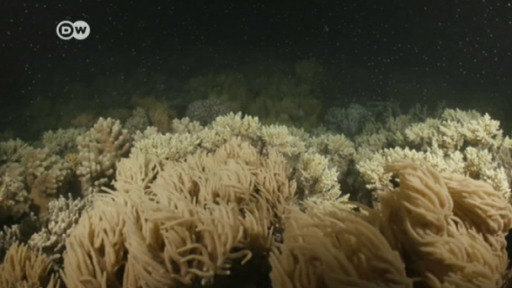 Bleaching occurs when abnormal environmental conditions, such as warmer sea temperatures, cause corals to expel tiny photosynthetic algae, draining them of their colour. Corals can recover if the water temperature drops and the algae are able to recolonise them. But researchers said in January coral reefs which survive rapid bleaching fuelled by global warming would remain deeply damaged with little prospect of full recovery. The Barrier Reef - already under pressure from farming run-off, development and the crown-of-thorns starfish - escaped with minor damage after two other bleaching events in 1998 and 2002. Conservation group WWF-Australia said Friday the latest bleaching increased the urgency of tackling climate change in Australia, one of the world's worst per capita greenhouse gas polluters. "I did not anticipate back-to-back bleaching this decade," WWF-Australia's oceans division head Richard Leck said. "Scientists warned that without sufficient emissions reductions we could expect annual mass bleaching of the Great Barrier Reef by 2050. Consecutive bleaching events have arrived 30 years early." Advocacy group the Australian Marine Conservation Society added Friday that the construction of a mega India-backed coal project near the reef should be abandoned as it would put further pressure on the natural wonder. The reef scientists plan to conduct further surveys over the next few weeks to determine the extent and severity of the bleaching. Canberra in 2015 narrowly avoided UNESCO putting the reef on its endangered list, and has committed more than Aus$2.0 billion (US$1.5 billion) to protect it over the next decade. Nearly two-thirds of shallow-water corals in a 700-kilometre stretch of the reef's northern section were lost to last year's bleaching event, scientists have said.